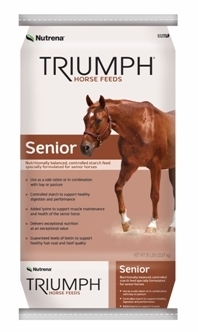 Triumph® Senior Horse feed provides exceptional value in meeting the unique nutritional needs of older horses. This highly palatable, controlled starch formula can be fed as the sole ration or in combination with high-quality hay or pasture. Plus, it's easy to handle and eliminates the sorting of ingredients. 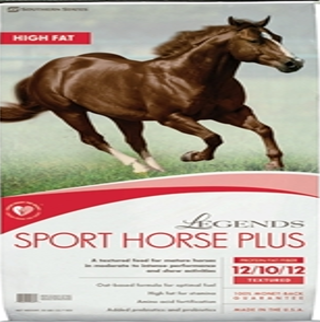 Controlled Starch to support healthy digestion and performance of senior horses. Delivers exceptional nutrition at an exceptional value. Guaranteed levels of Biotin to support healthy hair coat and hoof quality. Triumph® Senior is Currently Only "Stocked" At the Endicott Store. 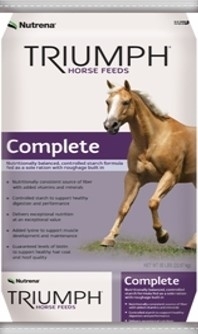 Triumph® Complete horse feed is formulated to be fed as a sole ration to breeding, maintenance and performance horses. Triumph® Complete provides exceptional value by combining high-quality fiber and grains in a single, pelleted feed. Nutritionally balanced, controlled starch, all-in-one feed including hay. 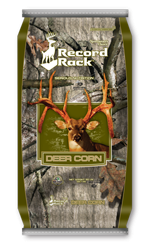 Record Rack® Super Premium sweet Deer Corn is an excellent source of energy for deer-and it is comprised of select, test-weight corn for high energy and high nutritional value. Double cleaned to remove foreign material and to remove dust. Also, this is tested to guarantee aflatoxin levels are less than 20 PPB. This is safe for all wildlife critters, including quail and other gamebirds. This can be hand-fed as an energy supplement, offered with natural forage, or as part of a balanced diet. *Currently this is only available at the Owego Agway. Stop in to pick up a bag, today! Nature Wise™ Non-Medicated Starter/Grower feed is a natural, balanced nutrition to support strong and healthy growing chicks. It is a complete, nutritious vegetarian chick diet-requiring no need for supplementation. It is fortified with vitamins and minerals to support healthy growth and development. Contains a blend of nutrients that support the immune system and overall health of your chicks. Added Aztec Marigold meal to improve skin coloration, added prebiotics, probiotics and yeast culture that support digestion. No Added Hormones, or Animal By-Products! 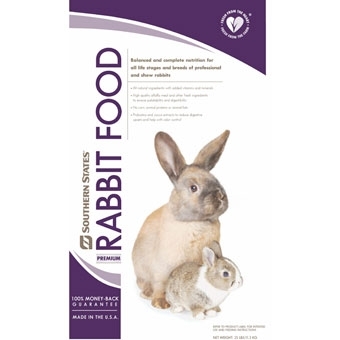 Southern States Premium Rabbit feed is an 18% protein, complete feed for all life stages and breeds of growing and mature rabbits. This feed is highly palatable and digestable containing probiotics and yucca extracts. This feed is designed to be fed as the sole ration for finishing and maintenance turkeys, and gamebirds including pheasants, quail, and chukar. Balanced amino acids support optimum growth and feathering, as well as balanced calcium levels for strong skeletal development. 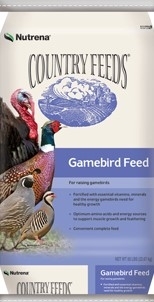 This feed is designed to be fed as the sole ration for growing turkeys and gamebirds, including pheasants, quail, chukar, and guineas. Amino acid balance supports optimum growth and development. Balanced calcium promotes strong skeletal growth. Also, a complete vitamin and mineral pakcage optimizes lean tissue growth and feathering. This feed is designed to be fed as the sole ration for starting turkeys and gamebirds, including pheasants, quail, chukar, and guineas. 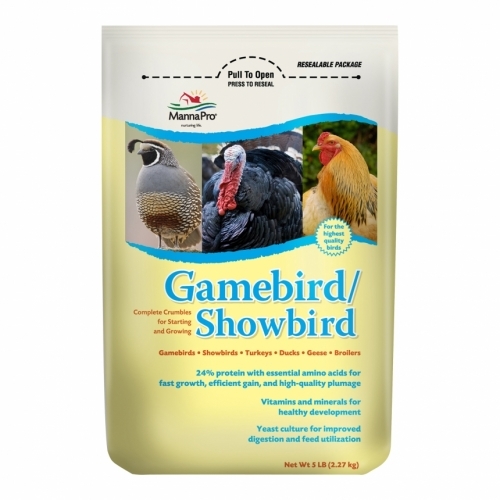 It is fortified with essential vitamins, minerals and the energy gamebirds need for healthy growth. Optimum amino acids and energy sources support muscle growth and feathering. 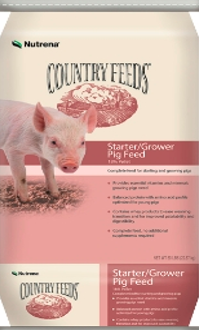 It is a convenient, complete feed that comes in a crumble formula that encourages feeding. 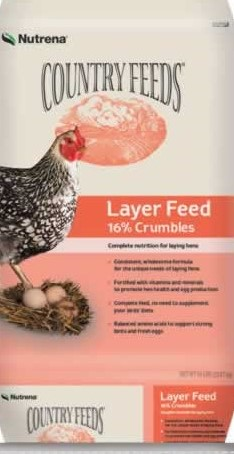 Complete nutrition for laying hens. Country Feeds™ Egg Layer Meal provides your layers with the proper balance of protein, vitamins, and minerals needed to support health and produce quality eggs. Complete nutrition for laying hens. 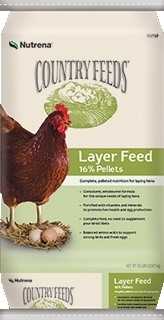 Country Feeds™ Egg Layer Pellet provides your layers with the proper balance of protein, vitamins, and minerals needed to support health and produce quality eggs. A Convenient, value-priced, multipurpose, 16% Sweet Feed is a great choice for mixed herds including cattle, sheep, horses, and goats. Composed of high-quality grains it is an economical source of energy. Added molasses to enhance palatability. Safe for sheep, contains no added copper. It is designed to be fed to animals as a supplement free choice pasture. A Convenient, value-priced, multipurpose, 12% Sweet Feed is a great choice for mixed herds including cattle, sheep, horses, and goats. Composed of high-quality grains it is an economical source of energy. Added molasses to enhance palatability. Safe for sheep, contains no added copper. A complete medicated feed for starting and growing pigs. A textured, fixed ingredient formula specifically designed for mature horses in moderate to intense performance and show activities. This highly palatable and digestible, oat-based feed will provide optimal fuel to maximize your horse’s performance. The “Plus” means high-fat (10% minimum fat guaranteed) which provides increased calories for stamina and improved body condition under heavy work. Complete nutrition for laying hens. Country Feeds™ Egg Layer Crumble provides your layers with the proper balance of protein, vitamins, and minerals needed to support health and produce quality eggs. 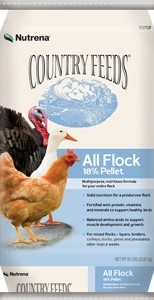 Country Feeds™ All Flock Pellet provides solid nutrition to keep your flock healthy and productive, with the added convenience of feeding from just one bag. A multi-purpose, nutritious formula that meets the needs of many species of poultry including layers, broilers, turkeys, geese, ducks, and pheasants. It is convenient and flexible to feed to multiple species. 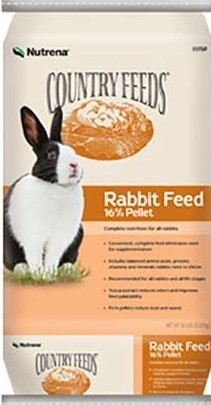 Country Feeds 16% Rabbit Pellets help enhance growth, feed efficiency, and good health for all rabbits. It provides the proper amount of nutrients your rabbit needs to thrive. A convenient, complete feed that helps eliminate the costly need for supplementation. Includes amino acids, protein, vitamins and minerals. A mixture of USDA Certified Organic Grains. 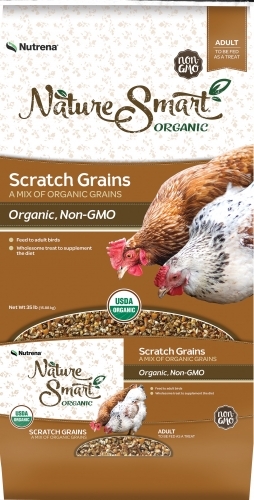 NatureSmart Organic Scratch Grain is expertly formulated with all the wholesome, nutritious ingredients your flock needs. A wholesome treat to supplement your flocks diet. Designed to be fed to adult poultry. 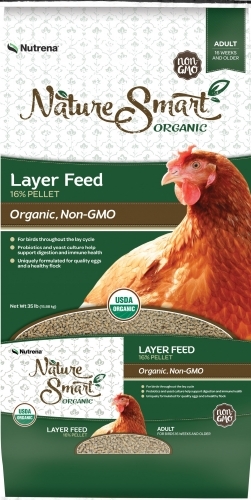 NatureSmart Organic Egg Layer Pellet is expertly formulated with all the wholesome, nutritious ingredients your flock needs. It is made with responsibly sourced, USDA Certified Organic ingredients so you can feel that you are doing the right thing for your flock. For birds 16 weeks and older. Formulated with probiotics and yeast cultures that support digestion and immune system health. Extra calcium supports hard shelled eggs! NatureSmart Organic Egg Layer Crumble is expertly formulated with all the wholesome, nutritious ingredients your flock needs. It is made with responsibly sourced, USDA Certified Organic ingredients so you can feel that you are doing the right thing for your flock. 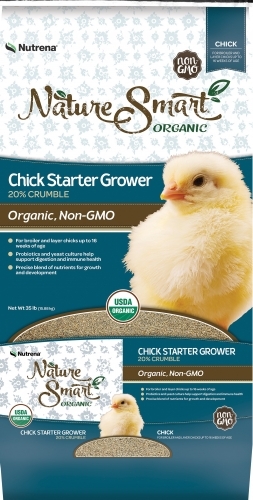 USDA Certified Organic Chick Starter/Grower is expertly formulated with all the wholesome, nutritious ingredients your flock needs. For use in both broilers (until finish) and egg layer chicks (up to 16 weeks). Formulated with probiotics and yeast cultures that support digestion and immune function. 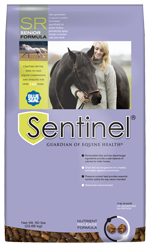 Sentinel Senior® is a nutrient release formula-the new generation in equine nutrition formualted specifically for senior horses, prematurely aging horses, or horses with poor teeth. It is a highly fortified balance of nutrients and an exclusive blend of natural additives to meet increased nutritional demands of the senior horse due to less efficient digestive and metabolic systems. This pressure cooked feed offers a safe and natural way to provide essential nutrition and calories to senior horses. 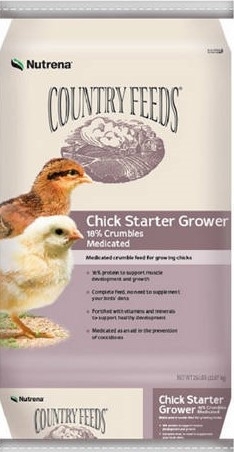 This medicated starter/grower feed will start your chicks off right! A complete feed that features 18% protein meets the demands of healthy, growing chicks! It is fortified with vitamins and minerals to support healthy growth and development. No need for supplementation. Medicated Crumble form encourages feeding and helps prevent illnesses such as Coccidiosis.